I photographed this Male Indian Robin using on Canon EOS 5D mark II using Canon EF 400mm f/5.6 L USM on very cloudy evening. Female was nearby but I could not get a good shot of her. The Indian Robin (Saxicoloides fulicatus) is a species of bird in the Muscicapidae family. It is found in Bangladesh, Bhutan, India, Maldives, Nepal, Pakistan, and Sri Lanka. The males of northern populations have a brown back while those of the southern populations have a black back. They are found in open scrub areas and often forage along the ground and perch on low shrubs and rocks. 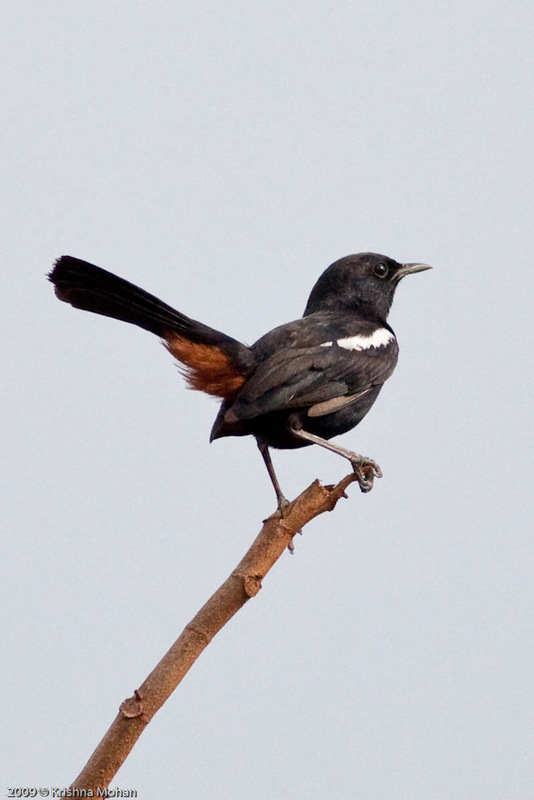 This bird is found in open stony, grassy and scrub forest habitats. The tail is held upright and the vent is brown or dark chestnut. The males are glossy black with a white shoulder patch while females are smoky brown with grey underside. The nominate race is found in southern Peninsular India. Race leucopterus is found in Sri Lanka. Race cambaiensis of western India and erythrura (erythrurus) of eastern India have the males with brown backs. Race intermedius is found in central India and parts of the Deccan region. A race munda was named for a specimen from Punjab but is now considered synonymous with cambaiensis. Older classifications include a race ptymatura for the population in southern India with the typical form being considered as being from Sri Lanka. The species is often found close to human habitation. Males sing during the breeding season and males display to females by lowering and spreading their tail feathers and strutting around the female. Nests are built between rocks, in holes in walls or in a tree hollow. Nests are lined with animal hair and it has been noted that many nests have pieces of snake sloughs. The eggs are of regular oval form, but many are elongated and a few pointed. They have a fair amount of gloss. The ground-colour is white, often tinged with faint green or pink, and this is rather closely spotted, speckled, streaked, and mottled, with rich reddish or umber-brown and brownish yellow, with some underlying lavender. The markings are denser at the larger end of the egg, where they form an irregular cap. Some eggs are blotched with dark reddish brown at the large end. Eggs measure from .76 to .84 in length, and from .55 to .62 in breadth. There is anecdotal evidence of them laying their eggs in the nests of Turdoides babblers. Chicks have black down. The breeding season is December to September but varies according to region and usually begins with the first rains. Males sing during this season. They may sometimes peck at their own reflections during this time. Peak breeding in northern India is in June and is earlier in Southern India.In Sri Lanka it breeds in March to June and August to September. Cyclic changes in melanin pigmentation of the testes associated with breeding have been noted. Three to four eggs is the norm but clutches of up to seven have been noted. Only the female incubates. Eggs hatch in about 10 days. Both males and females feed the young and males sometimes feed the female at nest. Nestlings are known to be preyed on by the Rufous Treepie(Dendrocitta vagabunda). EXIF info - Aperture : ƒ/5.6 | Camera : Canon EOS 5D Mark II | Taken : 17 May, 2009 | Flash fired : no | Focal length : 400mm | ISO : 800 | Location : 12° 55′ 19.3152″ N 74° 51′ 57.494159928122″ E | Shutter speed : 1/6400s | Images and content Copyright © Krishna Mohan. Please contact me to purchase prints or for image publication license. Looks little soft on my screen ..